I love being a first birthday photographer. When a baby turns one, they’ve developed so much personality. Every first birthday session I have is different. Some little ones warm up to me rather quickly and give me nothing but smiles. Sometimes, they are a little suspicious when they come to my studio and need a little more time to warm up to me. Often times, little ones are very serious and rarely flash a grin at me. If they come to me as walkers, usually, they want to walk everywhere around my studio but where I need them to be. No matter what the personality, I absolutely love playing with and getting to know every little one that comes to my studio. Most of my first birthday sessions are of clients who came to see me as a newborn. That’s always great to see how much they’ve changed over the past year. This little lady wasn’t too sure about me at first. It took a lot of jumping around and making noises to get a smile out of her at first. I always say there should be a photographer taking pictures of the photographer and family trying to get a baby to smile. She eventually warmed up to us and I had so much fun playing with her. My absolute favorite shot is of her licking the bucket I had put her in. Mom, Dad, and I were doing everything we could to get a smile out of her and, bless her little heart, she just sat there starring at us and licked my bucket! It was fantastic! I loved being her first birthday photographer. Here are a few of my favorite images from this sweet little ladies session. Enjoy! liz - I love all the emotion you got from this little girl! There is so much joy in her eyes! Looks like she really enjoyed her session with you! 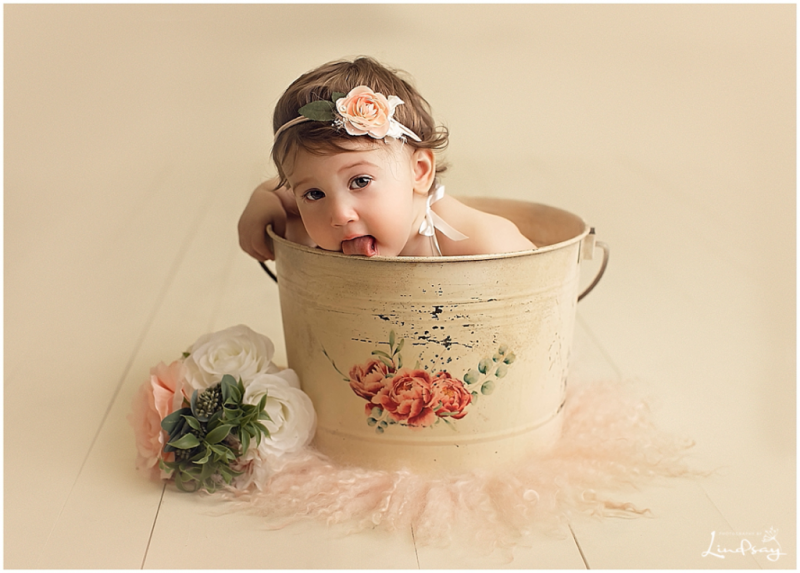 Emily - This first birthday session is perfectly styled! I love all of the options and sets you provide. Christie - Aw her little face is SOOOO cute!!! Baotran - I love all the variety you got in this session, she is all smiles for you! Katie - These are absolutely PRECIOUS!! Beautiful setups and gorgeous little girl. Stunning work!